For over a decade, Mahendra Singh Dhoni has captivated the world of cricket and over a billion Indians with his incredible ingenuity as captain, wicketkeeper and batsman. 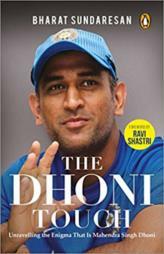 Bharat Sundaresan tracks down the cricketer's closest friends in Ranchi and artfully presents the different shades of Dhoni-the Ranchi boy, the fauji, the diplomat, Chennai's beloved Thala, the wicketkeeping Pythagoras-and lays bare the man underneath. He discovers a certain je ne sais quoi about the man who has a magical ability to transform and elevate everything which comes into his orbit-the Dhoni Touch.